I was thinking only the other day that I hadn’t heard from David Battersby for a while, and lo and behold a few days later, the sixth of April, this one turned up on my doorstep in the usual plain white envelope. I mention the date because had it arrived five days earlier I would almost certainly, as soon as I saw the title, have come to the conclusion that I was faced with an April fools’ joke. So the first question to be tackled is why on earth would a man from the west of England want to write about such a subject? There is an introduction from Battersby, which explains that what rattled his cage was the purchase of a programme of the 1969 version of the competition, although it is non-specific as to where he bought it or why. I would like to know, but as a man who has been known to purchase some strange bits of cricketing ephemera myself I can appreciate that it may be the case that there is no sensible explanation that can be articulated for that one. His interest piqued Battersby has certainly done the sensible thing and enlisted the help of three of the Shaky Isles’ foremost cricket historians in Rob Franks, Bill Francis and David Parsons, the work of all of whom has gone down very well with us in the past. Battersby also spoke to a couple of participants, former Test players Mark Burgess and Bruce Taylor. I was delighted to note that Francis is currently working on a biography of Burgess, but at the same time a little disappointed that the same cannot be said of Taylor, a man who I do know has led an interesting if at times chequered life. For each of the six years the tournament ran there were sixteen participants, so eight first round games, followed by four quarter finals, two semis and a final. It was man against man over five six ball overs with nine fielders and a wicketkeeper provided by the Auckland association. Of the sixteen all were locals save one, former Worcestershire and England all-rounder Martin Horton who, at the time, was New Zealand’s national coach. With help Battersby has tracked down all the results and enough press reports to enable him to wrap a commentary around the scores. By far the most successful participant was Burgess (three times winner and once the beaten finalist). The other three men to succeed in the final were John Sparling, Horton and, the only winner I had to look up on Cricketarchive, Arch Taylor. After six years the tournament ended, to be replace for the next two years by a double wicket competition before the event was consigned to history. The reasons for that are not apparent, although doubtless having initially been financially viable the experiment eventually ceased to turn a profit. 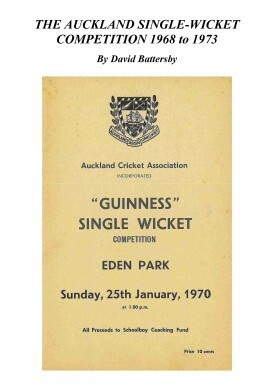 The Auckland Single Wicket Competition 1968 to 1973 is, as always, available directly from the author in Cheltenham, whose contact details we can make available. For obvious reasons this interesting piece of research is likely to arouse some interest in the Southern Hemisphere, and buyers there may prefer to approach Roger Page or Ken Piesse. Michael Vaughan tells the full, compelling story of a remarkable career - from his early days at Yorkshire, to his emergence as a world-class batsman.